I seek adventures that scare me. Living life on the other side of my fears is the greatest reward possible. While in St. Thomas, USVI, I had the opportunity to try flyboarding over the pristine waters of Lindbergh Bay with St. Thomas Flyboarding. I was scared; heck, I was petrified. Flying 30 feet above the crystal blue waters, diving like a dolphin, or even trying a backflip or two all sound intimidating enough but strapping a water jetpack board to my feet while doing it is just plan insane. I’m not Ironman; these are things in movies and dreams about the future, right? Nope! It’s the here and now and I did it; and let me tell you – it is absolutely exhilarating, insane, and beyond awesome! 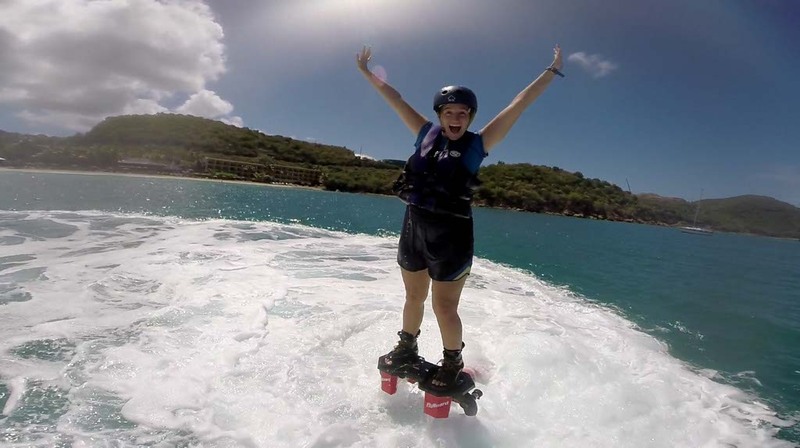 My whole life I’ve actually been training to be Iron Woman without realizing it and St. Thomas Flyboarding let me put my skills into action. The board was attached to my feet while my instructor went over the basics with me. It was connected by a long hose to a jet ski where water was forced to my boots with jet nozzles underneath. I could fly up to 15 metres in the air or dive headlong though the water, but all of that took skill and I wasn’t sure I would be successful at even standing up. Once the boots were strapped on my feet, I laid in the water. The boots were turned on and I was thrust through the water, pulling the jet ski behind me. My recent kiteboarding lesson helped me feel more comfortable with being pulled or pushed quickly through the water. I didn’t feel overwhelmed when I was splashed in the face a few times and I welcomed the higher speeds. We went out about 50 feet before I started to fly. Even pulling the jet ski out was an adventure. I felt like a dolphin as I glided quickly over the water. I got into position, with the board under my feet and my legs straight, and the thrust was turned up. Shakily, I rose up from the water. It was like combining surfing and snowboarding. I didn’t get my balance the first try but I had a reference in my mind and it gave me the confidence to stay focused. Sometimes when trying something extreme the first time, it’s so nerve-racking that it’s impossible to process it all. With previous water sport experience, I didn’t get over-whelmed. Leaning forward proved more difficult than I anticipated and I fell back, hard, into the water a few times. I was so full of adrenaline, though, that I didn’t even really notice or slow down. Within the first three minutes, I was able to stand on the board while hovering about five feet out of the water. I shifted my weight from left to right as I learned how to turn. I would have been pleased with just doing that for a half hour but my instructor asked if I wanted to try a dive. He explained the process and my heart began racing. I wasn’t sure if I was ready, but I listened attentively. Without over-thinking it, I found a focal spot in the water and dove! Screaming with delight, I emerged from the water. I didn’t manage to do any backflips, at least not intentionally or without in fact landing on my back, but it was still the ultimate adventure. Jetpacks are Only Real in Movies, Right?